A convenient carrier filled with 96 fl. oz. of brewed coffee. Choose between Veranda Blend® Blonde Roast, Pike Place® Roast, our featured Dark Roast, or Decaf Pike Place® Roast. This is our way of lending an extra hand to all those kind souls who purchase coffee on behalf of family, friends and workmates. Our coffee traveler holds the equivalent of twelve 8-ounce cups of brew. 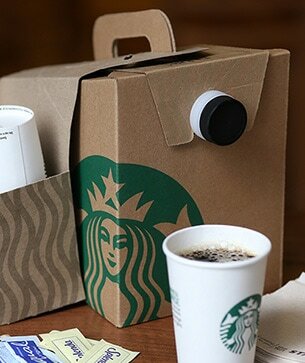 Great for meetings, picnics and whenever you need a steady flow of truly great coffee. Choose between Veranda Blend® Blonde Roast, Pike Place® Roast, our featured Dark Roast, or Decaf Pike Place® Roast. Unlike air travel layovers, your coffee travel can be seamless with no wait time. Just call ahead to order and it’s ready to roll when you are.